Could monkeys run the financial system better than us? 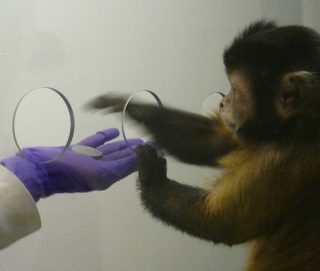 Mostly we hear about scientific experiments testing whether monkeys are as smart as we are. But Laurie Santos is looking at things through a slightly different lens. Humans make some silly choices. And sometimes, they have pretty serious consequences. Ever since the finance world crashed in 2008, people have been asking how we could possibly have let this happen. Psychologists and economists in particular have begun working more closely together to look at how humans deal with money and risk – both bankers working with huge amounts of money to strike deals with companies, and people taking out loans or mortgages. The results aren't great, but they do help us understand how the banking system got so out of hand. , but if you know a little bit about how our brains work, they are understandable. Laurie Santos is a professor at Yale studying whether we can find out from species similar to us where our irrationality comes from, and how to design systems to protect us from ourselves. And judging by her work so far, it looks like we're not so different from our monkey cousins – in fact, they could probably run the financial system just as well (or just as badly, depending on how you look at it) as we do. Tell us about you – what you do, how you came to study monkeys, and what you're up to now! My name is Laurie Santos and I'm a cognitive psychologist (that’s someone who studies the mental process of thinking and getting information). Specifically, I’m looking at how animals think about the world. I focus on two sets of species: monkeys, who are some of our closest living relatives; and domesticated dogs, who are one of the few non-human species that live in human-like environments. I started working with monkeys because I was really curious to learn more about what makes humans special. To test this, you need to explore cognition in a close evolutionary relative. Monkeys are a nice window into what human cognition might look like if we didn’t have culture, teaching, and a human-like environment. What does 'cognition' really mean? Cognition is basically just a word for the way that our brains process information. People who study it are looking at the mental processes behind learning something, thinking about it, and figuring out what it really means. Could you sum up your 'monkeynomics' experiment in a few words – what you were trying to find out, what you expected, and what you found? The goal of our "monkeynomics" work (done in collaboration with researchers Venkat Lakshminarayanan and Keith Chen) was to test whether some of our more common behavioral biases were unique. People often make decisions in pretty irrational ways – we pay too much attention to losses, we evaluate our choices in relative and not absolute terms, and we tend to overvalue our own stuff. We asked whether humans are alone in these irrational behaviours, or whether other animals have them too. So we gave a group of capuchin monkeys their own ‘token economy’ and explored the strategies monkeys use when they’re making decisions. The way we did this was basically to let monkeys pay for their own food with small tokens. You say in your TED talk that you feel humans need to figure out systems that protect us from our irrational ways, rather than pretend they're not there. Do you think the banking and finance world has managed to do that at all? I think there's a lot of room for improvement. I'd love to see more of the work on behavior change and our own implicit biases being used to better design financial systems. Do you think we'd have a more stable banking system if people understood how it works more clearly? Definitely! The nice thing about human irrationality is that it's really systematic – we show a set of biases that can be worked around if people think creatively. So I think there's a lot to be done to make the systems we use a little more irrational-user-friendly.